After a long, hot summer that has lasted well into autumn, it finally feels like fall around here. And with the change in weather comes a change in menu, moving away from steady grilling to heartier, kitchen-based meals. If you’re like me, you want something new that your family will enjoy without the obnoxious, “Ew, what is that?” exclamation from the kids. This Creamy Chicken & Broccoli Alfredo is exactly what you need to bring an exciting new dish to the table that feels familiar, but new. Essentially this dish is fettuccine Alfredo, but with the delicious additions of perfectly cooked chicken, tender broccoli, and bacon. And it’s incredible! My daughters both love this dish and it has been moved to our regular rotation. Place strips of bacon in a single layer on a cookie sheet and bake in a 450 degree for 10 minutes. Flip each piece of bacon and bake for another five minutes. Remove, pat the bacon dry, then chop. Bring a pot of water to a boil and add broccoli florets. Boil for 8-10 minutes, or until broccoli is cooked through. Drain and set broccoli aside. Cook fettuccine according package directions. In a large pan, heat the olive oil on medium-high. Add the chicken breast and season with salt, pepper, paprika and oregano. Cook the chicken breast for 4-5 minutes on each side, until each side gets a nice brown coating. Put the lid over the pan and lower heat to medium. Continue to cook until chicken is completely cooked through. Remove the chicken from the pan and cut into 1/4″-thick slices. In the same pan, add a little more olive oil and saute the minced garlic until fragrant. Add the milk and heavy cream and bring to a boil. Add the Parmesan cheese and stir until combined and cheese is melted into the sauce. Add the fettuccine, chicken, bacon and broccoli and stir to combine. The most challenging part of this meal is managing the various parts. It takes a few pots and pans to get the broccoli, bacon, chicken and pasta all cooked without too much delay between, but following the preparation instructions in order should help. 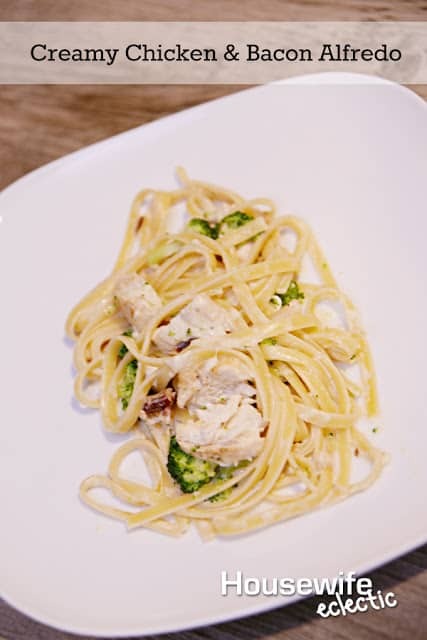 Even though it’s not a quick-fix meal, it’s worth the preparation when you get a bite of creamy pasta, chicken, broccoli and bacon. We bake our bacon as well–so much simpler and way less mess than doing it on the stove! And you could definitely skip a step by boiling the pasta and broccoli together (the most it might do is tint your pasta green, just call it a Dr Seuss dinner and keep on truckin' lol). This sounds so delicious! I love the addition of bacon! This looks good and like something my kids would eat! Being vegan this isn't something I'd eat, but I'm up for trying a vegan version of this! SO many great meat alternatives, and tempeh bacon is the bomb! Oh carbs. I hate and love you. This looks really good. That sounds delicious! I love Alfredo, and this bacon version sounds perfect! Yum Youm! I love alfredo! This looks like an easy and delicious meal for a weeknight! If it's pasta, I'm ALL ABOUT it! 🙂 Yumm. That looks so delicious. I'm sure the bacon added more flavor to the dish. This looks so good! I'll have to make it! Although I am a vegetarian even I have to admit that this looks pretty good! This looks so incredibly delicious! Definitely going to be giving this a try thanks for sharing dear! You just made me intantly hungry! This looks amazing! I've never had bacon with an Alfredo sauce and pasta before. I bet it adds a really nice flavor to it.